Nothing says comfort like a well-fitting chair. Amish made desk chairs are designed not only for beauty, but also for your comfort. Each chair is hand-made by Amish artisans in their own woodshop. It is crafted with Old World skills that have been handed down from father to son for generations. 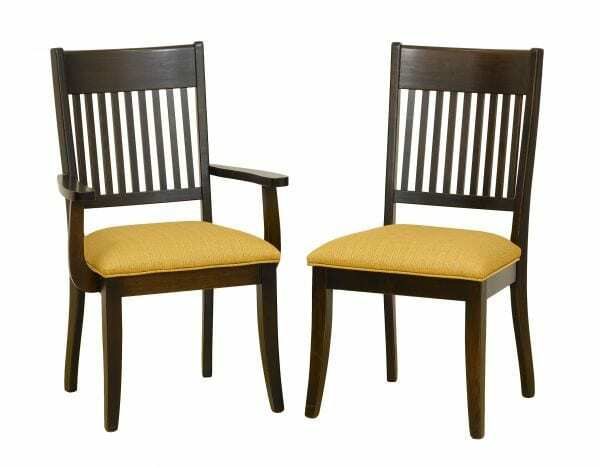 Each chair is made of local hardwoods and designed to look beautiful and fit you well. The wood to be used is fresh sawn. The Amish craftsman carefully chooses the pieces he needs to create beauty with the markings of the wood. He hand saws and fits them together for durability. Your chair will last for generations. The wood is then smoothed and finished with loving care. Fabric or leather upholstery is often added for additional comfort. Upgrade your office furniture today with Amish made desk chairs. Add stationery ones for the front of your desk for clients and a matching swivel one behind the desk for you. Contact us for details on shipping, delivery, and custom orders. Get directions to our store, and come in and choose the chairs that are the most comfortable for you.